Silas and Ethel Woodlock retire to spend their twilight years by thesea, only to find themselves traumatised by herring gulls. Londonjournalist Stephen Osmer writes a provocative essay about twopeople called Nicholas Royle, one a novelist, the other a literarycritic. Whether Royle, the literary critic, is having an affair withthe beautiful Lily Lynch, and has stolen and published SilasWoodlock’s short story, ‘Gulls’, becomes a race to the death forat least one of the authors.Playfully commenting on the main story are 17 ‘Hides’: primarilyabout birds, ornithology and films (including Hitchcock’s), theseshort texts give us a different view of the messy business of being human, the fragility of the physical world we inhabit and the nature of writing itself.Witty as well as erudite and delightful in its wordplay, An English Guide to Birdwatching explores the fertile hinterland between fact and fiction. 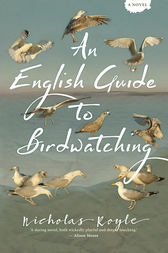 In its focus on birds, climate change, the banking crisis, social justice and human migration, it is intensely relevant to wider political concerns; in its mischief and post-modern (or ‘post-fiction’) sensibility, it celebrates the transformative possibilities of language and the mutability of the novel itself.